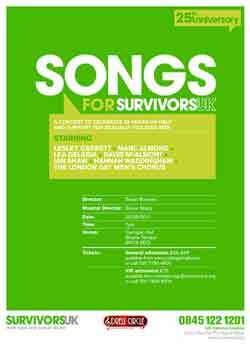 On Sunday 22nd May at 7:00 pm there will be a Songs For Survivors Concert at Cadogan Hall in London’s Sloane Square. Songs For SurvivorsUK marks the 25th anniversary of this pioneering organisation that provides a national helpline and London based counselling services to men who have experienced sexual violation at any time in their lives. The charity also assists the partners and carers of these men and provides links and signposting to services around the country.